Please send the item(s) back using the original package and include a copy of your receipt, invoice or packing list, so that we can correctly process your return and issue a refund. Please use original package and copy of receipt or packing list attached with your order, so that we can correctly process your return and issue a refund. Item(s) you wish to return should be mailed to the following address. Be sure to ship the package with a carrier that can provide tracking and insurance. We cannot replace packages lost during return shipment if proof of tracking is unavailable. You will receive a refund in the same form as you used as payment for item(s) ordered. Please allow 15 business days for us to process your return and issue a refund. You will be notified via e-mail once the refund has been issued. The number of days it will take your issuing bank to show the credit to your statement depends upon the issuing bank and/or billing cycle. What if the item is damaged or not what I ordered? We'll pay the return shipping cost if the return is the result of our error, or if you have received a damaged or defective item. Please contact us and we will arrange shipping. What if you need to return a gift? The credit can be applied to the original purchaser's credit card or we will happily give you a store credit for the amount of the original purchase. If you would like a store credit, just indicate your preference on the return shipment. Can I return items to locations other than to your warehouse in the U.S.A.? 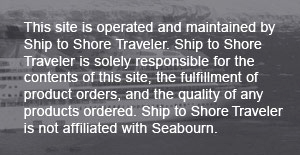 All items must be returned to our warehouse, including items that have been delivered to the ship.